This week, I am joined by botanical illustrator Işik Güner who tells us all about her work from her studio in Turkey. Işik is well known for her extraordinarily accurate depictions of plants in watercolour and for her passion for plant conversation. She worked extensively on Plants from the Woods and Forests of Chile, is art editor for the Flora of Turkey, has paintings in the Transylvania Florilegium, held an exhibition to promote the conservation of the Orchids of China in China and teaches all over the world, having just finished a stint as Artist in Residence at Denver Botanic Garden. Currently, Işik is on cusp of finishing all of her preparatory work for her new book. Işik originally trained as an Engineer and took to painting after her studies. 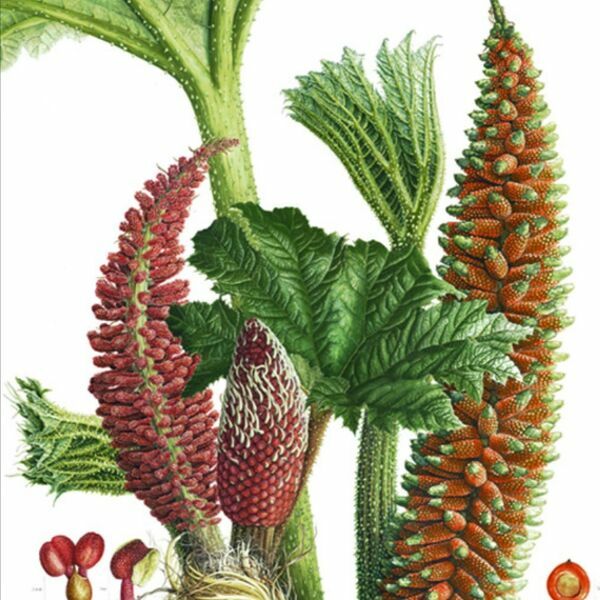 In 2014 she was awarded a prize for the best illustration at the 2014 RHS (Royal Horticultural Society) botanical art exhibition in London for her splendiferous rendition of a Gunnera tinctoria pictured here. For the first few minutes of this podcast, we are taken to Red Square in Moscow, and at the end of the show we can listen to some very pretty bells which were again recorded in Moscow. I am continuing to play around with sound and the different effects you can achieve with field recording. I view these segments very much as one would an audio sketchbook. The short mixes form the preliminary work that will influence the direction of the final audio component of my latest project on the Blue Flower. IMAGE: Gunnera tinctoria by Işik Guner © Watercolour on paper.